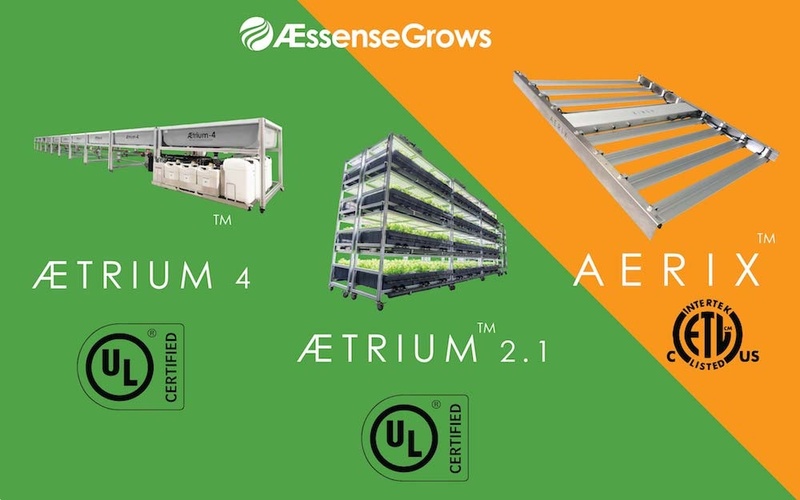 SUNNYVALE, Calif., Nov. 13, 2018 -- AEssenseGrows, an AgTech company specializing in automated precision aeroponic platforms for consistent high-yield plant production, announced today that its complete AEtrium System grow environment received the coveted UL listings, validating its electrical safety. Underwriters Laboratories (UL) is the largest not-for-profit testing laboratory in the world. The listings mean UL has tested representative samples of the products and determined them to be electrical and fire safe. Both AEssenseGrows AEtrium-2.1 and AEtrium-4 grow platforms are now UL listed. AEssenseGrows’ newly introduced compact high-intensity AErix LED bloom lighthas also received an Electrical Testing Laboratories (ETL) safety listing, exceeding or surpassing all Standards for Safety published by UL and other standards bodies. The products will be on display Wednesday through Friday this week at MJBizConin Las Vegas at the AEssenseGrows booth, #2473. AEssenseGrows combines user-friendly advanced technology with aeroponic indoor farming methods to deliver an easier, more cost-efficient path to high-velocity superior yields. The fully automated system uses the Guardian Grow Manager central management control software, which tirelessly executes a remotely monitored, tightly controlled, precise, sensor-based grow recipe including environmental management 24/7, 365 days a year.